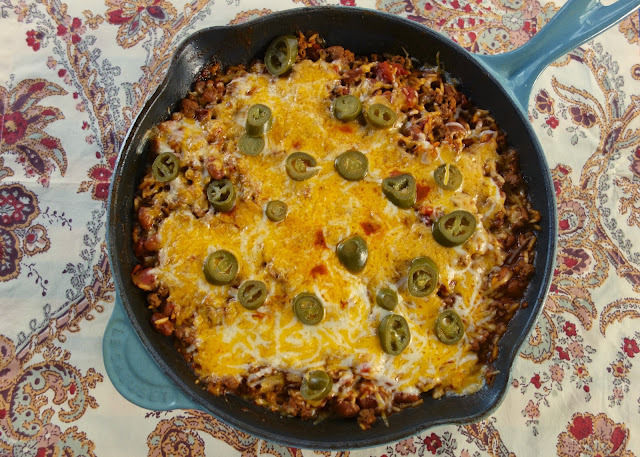 One Pot Skillet Chili and Rice - everything cooks in the same skillet! Ground beef, tomatoes, chili beans, rice, water, tomato paste, cheese and jalapeños - ready in 20 minutes! Great quick and easy weeknight meal! Chili is one of our favorite meals in the fall. I usually make a pot of chili and serve it over rice. I decided to take a shortcut and make the chili and rice together. This was delicious! It took less than 30 minutes from start to finish. The best part of the recipe is that it is all made in one dish! Easy clean up. This was a great meal without a lot of effort. You can take a shortcut and cook your meat ahead of time. I usually have some precooked meat in the freezer for quick weeknight meals. I used a can of Rotel chili fixins. It is basically tomatoes, green chilies and chili seasonings. If you can't find the Rotel chili fixins, use a can of tomatoes and green chilies and add a few tablespoons of chili powder. 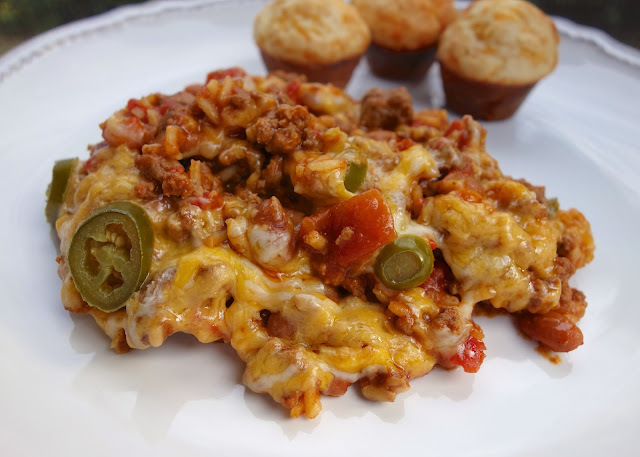 Serve this Skillet Chili and Rice with some Cornbread or Cheesy Biscuits for an easy and delicious meal! In a 12-inch skillet, brown meat. Drain fat. Add Rotel Chili Fixins, beans, rice, water, and tomato paste to skillet; stir to combine. Simmer, covered, for 20 minutes. Top with cheese and jalapeños, place under broiler until cheese is melted. My husband would love this! Can't wait to try it! Oh this looks wonderfully delicious! I've been craving chili.. I've got to make some this weekend! Jill - the rice is uncooked. It will simmer and cook for 20 minutes. Enjoy! This looks perfect for a quick fall meal! We like to make chili on a cool evening, but I don't think I've ever added rice. I'm adding this to my to-try list. Thanks! One pot meal are so awesome! Looks very comforting! Pinning, this is definitely being made for dinner soon! I love one pan meals like this that make dinner so easy to prepare. What would we ever do without a good skillet? Do you think this would work with instant brown rice? I have that on hand and would love to make this tonight! ehomaha - this would be good with instant brown rice. You would probably only need to simmer it about 10 minutes with the instant brown rice. Let us know how it turns out! I love one pot meals! And I love the idea of serving chili over rice! I adore one pot meals!! I need to try this one out, it looks fantastic! This would be a great tailgate dish too. It sounds delicious, Stephanie. I made this tonight, and it was a hit! My husband, who detests leftovers, insisted we save every last drop. He couldn't get enough of it! Thank you for sharing! YAY! Sounds like a success! !